Ajay Devgn is all set to adapt the life of Maratha leader Subedar Taanaji Malusare on the big screen in an upcoming film. On Thursday, Ajay Devgn tweeted the first look of the film and said: "He fought for his people, his soil and his king Chhatrapati Shivaji. The unsung warrior of glorious Indian history, Subedar Taanaji Malusare." Taanaji was one of Shivaji's close friends and aide and is known for 1670's Battle of Sinhagad, in which he reportedly reconquered the fortress of Kondana with the help of his pet monitor lizard (which also features on the poster along with Ajay Devgn). After Taanaji successfully entered the fort, a fierce battle ensued between him and Mughal fortkeeper Udaybhan Rathod. 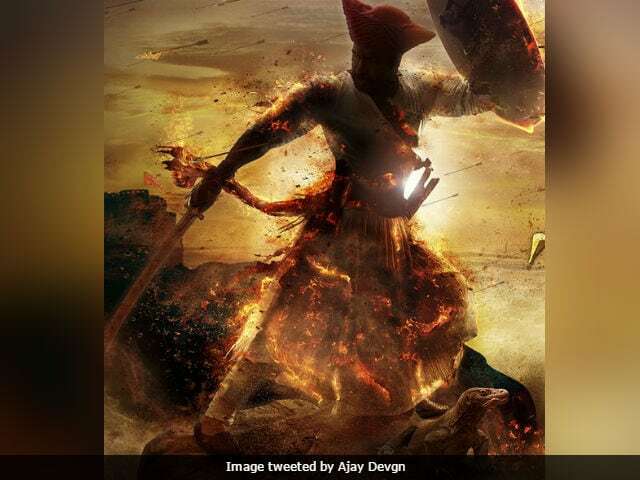 Though Taanaji died after the battle, his heroic deeds were sung in several Marathi ballads and now, it will be elaborated on the big screen by Ajay Devgn. Taanaji is co-produced by Viacom18 Motion Pictures and will be directed by Om Raut, who helmed Lokmanya Ek Yugpurush (2015). The film will hit the screens next year. Last seen in 2016's ill-fated Shivaay, Ajay Devgn will be next seen in Baadshaho and later in Golmaal Again. Baadshaho is a thriller set against the backdrop of Emergency and is directed by Milan Luthria. Baadshaho also stars Emraan Hashmi, Esha Gupta and Ileana D'Cruz. Golmaal Again is the fourth film in Rohit Shetty's Golmaal series. Tusshar Kapoor, Arshad Warsi and Shreyas Talpade will reprise their roles while Tabu, Parineeti Chopra and Neil Nitin Mukesh are the new joinees of the Golmaal crew.